Chuck Norris, who turns 70 today, is a world-wide phenomenon, less for his acting attributes in shows such as Walker, Texas Ranger, as for the humorous persona of invincibility that has grown up around him. 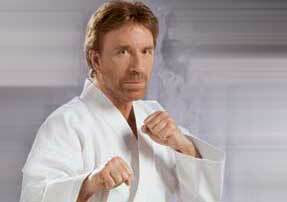 chucknorrisfacts.com is one site that carries on the great tradition of implausible Chuck Norris feats such as: ‘According to Einstein’s theory of relativity, Chuck Norris can actually roundhouse kick you yesterday’. Just goes to show we really do want to have someone in our life who always gets the job done. In fact, Norris has found that ‘Someone‘ for himself. He is a devout Christian and although, in typical American style, that has sometimes meant getting entangled in right-wing politics, he is a genuine man of faith. Posted in Books, FindingFaith, Movies, People, Quotable.Tagged birthday, Chuck Norris, Do Hard Things, God, Jesus.